This amazing home features a backyard patio and pool area with a spectacular custom pool with many features including island which feature sitting areas and fire pit a spa as well as incredible slide which goes into the swimming pool. The pool measures roughly 2300 square feet, and has a deep end of 10'0". The spa is raised and has 12 therapy heads. There is LED colored lighting throughout the project. There is a 300 square foot zero depth beach entry into the pool with agitator jets to keep the water moving. There is also a sunshelf within the pool. The lazy river wraps around the sunken island, and the current in the lazy river is propelled by a commercial waterpark quality pumping system. The sunken island has lighting, a fire pit, and a bridge connecting it to the decking area. There is an infinity edge on one edge of the pool. The pool also has an in-floor cleaning system to keep it clean and sanitary. The swimming pool also has the ability to change colors at night utilizing the amazing LED lighting system. The pool and spa exposed aggregate finish is French Gray color. The slide that cascades down the grotto is custom built. The waterfall grotto also provide a thrilling jump off point into the deepest part of the pool. This amazing backyard was designed and built for a home in Bull Valley Illinois. By Alder Group, Pool and Landscape Co.
Clients required a modern pool and landscape that was still child friendly and befitted the home and setting. The large L-shaped pool with slide was the answer! Natural stone accents of pool coping and armor stone add warmth. 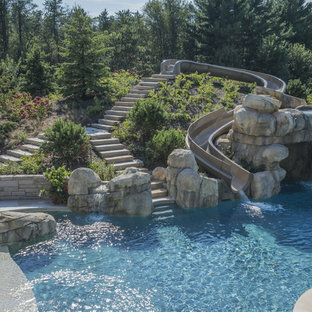 The pool slide if fun for the whole family! 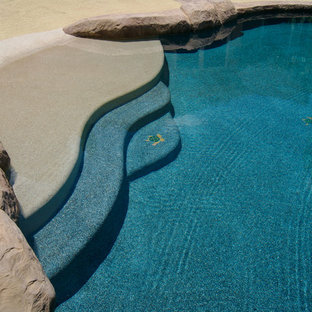 The custom pool entry steps double as sun ledges / tanning ledges. 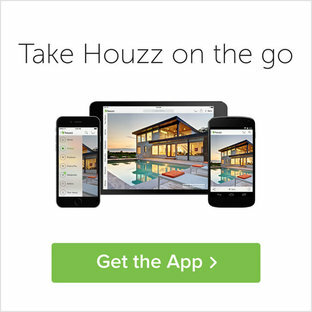 This amazing project won an "Award of Excellence" from Landscape Ontario in 2014. 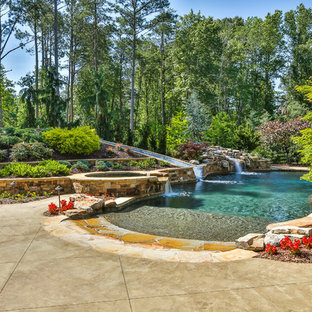 Landscape design by Melanie Rekola, pool and landscaping by Blue Diamond Pools. 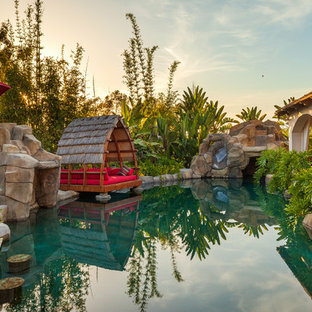 By L A Custom Pools and Spas, Inc.
Like a kid in a candy store given permission to pick anything he/she wants, so is our ability to design and build your dream pool and spa. He said make my wife happy....but I want this. She said build everything but the structure over the spa. L.A. 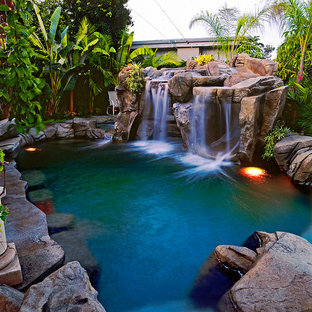 Custom Pools and Spas, Inc. said have faith in the design. She agreed they have no regrets. Natural tropical resort on a small residential lot with some heavy plantings, palm trees and a 25' slide. The front entry and family room view centered on the beach entry and boulder cave. Raised planters and the spa flank the cave. The spa spillway was made wider to place larger, more natural stone work. Also, the spa bench has an armrest so one's back does not rest against the boulders. The cave has a "random" stair-stepped stacked stone crafted entry giving a more natural look. Planting pockets flank the beach entry, which the Travertine pavers completely cover. Every resort needs a swim up cabana, bartender and television. Across the pool we have a great firepit to gather around and enjoy each other all seasons of the year. Photography by Mike & Laura Farley. Natural tropical resort on a small residential lot with some heavy plantings, palm trees and a 25' slide. The front entry and family room view centered on the beach entry and boulder cave. Raised planters and the spa flank the cave. The spa spillway was made wider to place larger, more natural stone work. Also, the spa bench has an armrest so one's back does not rest against the boulders. The cave has a "random" stair-stepped stacked stone crafted entry giving a more natural look. Planting pockets flank the beach entry, which the Travertine pavers completely cover. Every resort needs a swim up cabana, bartender and television. Across the pool we have a great firepit to gather around and enjoy each other all seasons of the year. Photography by Mike Farley.